In compliance with PRC’s requirement of a 120-hour CRES program, the CESAR E. SANTOS REAL ESTATE ACADEMY, INC. will conduct a 120-hour Comprehensive Real Estate Seminar (CRES) for aspiring Real Estate Appraisers in MAY 2011. This is in preparation for the Real Estate Appraiser’s Licensure Exam reportedly scheduled on JULY 31, 2011. NOTE: We are waiting for the PRC to issue a formal announcement regarding this revised exam schedule, or to at least update their website’s Calendar of Exams for the Year 2011. IMPORTANT: This is a face-to-face review. There is no online review for RE Appraisers at this time. Thank you! hI, IS THERE A REAL ESTATE CONSULTANT EXAMINATION REVIEW? THANKS..
[From RESAR] We haven’t heard of a review for RE Consultants, but as soon as we do, we will post it online. Thanks! when s the next sched for appraiser exam?where s your review center @ cebu? [From the Admin] Hi! We haven’t seen any PRC announcement regarding the next Real Estate Appraisers’ Licensure Exams, but if ever we hear about people organizing review classes in Cebu, we will post the info online ASAP. Thanks! Hi! Im a first timer here, and i want to be a real estate broker. What do i need? Are there any 120hr classes that start next year? [From the Admin] Hello! You need to be a college graduate. There is a 120-hour Comprehensive Real Estate Seminar and Review (CRESAR) in November 2011. Thanks! [From the Admin] Hi! As soon as we get the scheds of REA Review Service Providers, we’ll post the info online. Thanks! pls email me if you have another review offering for appraisers. this is if the exam is indeed moved to july 31. [From the Admin] The real estate appraisers’ exam review is on-going, and the deadline for applying for Exam Permits is usually 3 weeks before the actual exam date. If ever we find a Review Service Provider for you (given the short time remaining), we will publish the information online ASAP. Thanks! [From the Admin] We haven’t seen July review offerings for the Real Estate Appraisers exam. Some review service providers are saying the next RE Appraisers Exam will be in late July 2011. Please take note, however, that we haven’t seen an official announcement from the PRC. Hi, Kindly send me the next scheduled 120hr. real estate exam as I wasn’t able to join the review last May. [From the Admin] Hi! Are you interested in the review for RE Brokers or RE Appraisers? Thanks! Hi, Pano kung RE licensed broker tapos nakapasa ng RE Appraiser’s Exam dalawa ba ang magiging license (1 for REB and 1 for REA)? or 2nd level and REA kaya isa lang ang license ? [From the Admin] Hello! You will have two licenses: 1 for REB, and 1 for REA, because these are two different areas. Thanks! Please let me know if you offer online review for RE Appraisers. Thank you. [From the Admin] Hello! 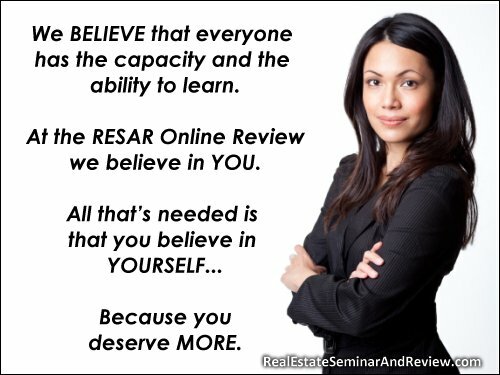 At the moment, the RESAR Online Review is for aspiring real estate brokers. If ever we offer an online review for RE Appraisers, we will let you know. Thanks! can you offer this course for march or april 2012? thanks! [From the Admin] If ever we get hold of info about people organizing review classes for that course, we will post the info online. Thanks! Pls. email me your sched for REA Review Seminar slated for June 2011, include how much do i need to pay and the venue. I would appreciate much if it will be sent ahead of time. Thanks and more power. [From the Admin] Hello! We have sent you email. Thanks! [From the Admin] There will be another 120-hour Real Estate Appraisers’ Review Seminar in June 2011. As soon as we get hold of the details, we will post it online. Thanks!